I've gotten another step closer to scrapping the remaining photos from Trevor's time in Cub Scouts. 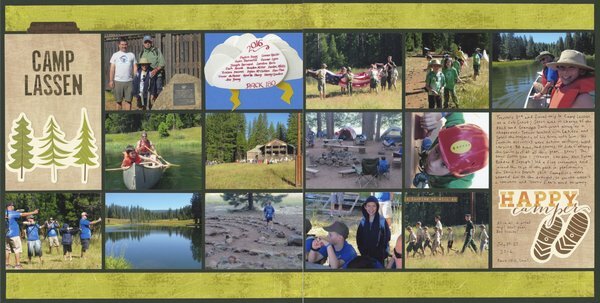 This two-page spread is from 2016, his third and final trip to Camp Lassen as a Cub. Since I scrapped this about 18 months after the trip, there was no way I could remember the details from a trip I didn't even attend. Thank goodness I keep a daily journal about Trevor's life (412 typed pages and counting). I just searched the document for Camp Lassen, then copied what I'd typed onto the journaling block, as good as if I'd scrapped it the day they'd returned home from camp! Loveeeeeee this! LOVING the photos, the trees and the boot prints!!!!! !